Kamon was released by Jactalea in their leather abstract game line in 2007, although the currently selling version has a leather board with all the pieces made out of high density foam. Kamon is a tricky game to put into a family as it combines a heavily constrained chain-restricted placements with victory conditions reminiscent of Hex. The game is played on a 37 hex leather board which is initially covered in a sea of little red chits. Thirty six of those chits depict between 1 and 6 of six different symbols while the 37th is the starting chit and shows the edge-but-not-corner positions in which the first placement can be made. Before the game begins, this starting chit is removed and placed to one side of the game board to start the pile and to leave a hole in the board that players will have to work around later. 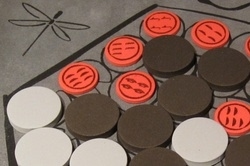 Players each receive 18 thick foam discs in black or white which will gradually replace the red chits as the game goes on. On the very first turn, the starting player places a disc in any edge space that isn't a corner after removing the chit there and placing it on the stack. For the following move, the other player must choose a space containing a chit with either the same number of symbols or any number of the same symbols at the top chit on the stack. Play continues until one of the victory conditions is met. There are three different winning conditions for the game. A player connects two opposite sites with a continuous chain of their pieces. Corner spaces are considered to touch both sides. A player creates a continuous loop which contains at least one space which is either completely empty or contains a chit or an opposing piece. In practice, it seems that the primary way of winning a game is by connections, or sometimes by being forced into a dead-end of matching chits where you're the first person to fall off the end. Despite this, the other two conditions add much interest to the game by forcing players to stay ready to block multiple things. The threat of such victories, rather than their completion is what helps the game along. Almost all of the games I've played have ended up being won by a sort of slow landslide victory. A careful player can set up winning opportunities for themselves with almost-made connections thus preventing their opponent from playing a piece on any other related chit, lest they hand you victory on your next move. Getting to these forked winning situations requires planning a little bit of distraction but still involves an uphill struggle to make best use of the limited placements you're being given. I'd say the most successful plans are laid out almost completely in the first half-dozen moves of the game, before it becomes too clear to your opponent what you're up to. As with any multi-side connection game, such as Cross, the corner spaces are very powerful, since they yield a connection to two sides. Perhaps the most efficient (and inconspicuous) connection is to simply occupy all the edge spaces along two adjacent sides. Even if the direct path is blocked, players can continue to build around. It's helpful to maintain some flexibility, always ready to branch connection opportunities out from that loop you're working with, and one must remain ever vigilant about being pushed into dead-ends or unfollowable moves late in the game. Kamon has a nice balance of forced choices pruning the decision space (with the restriction on following moves) and a wide-open space in which players are, at least at first, free to choose their own path of possible victories. A little further into the game, it becomes a great deal more tactical as the choices get cut down, and players start to play reactively, avoiding any imminent victory by their opponent while trying to change their own. This acceleration is what keeps the game short and interesting all the way through. With typically nice Jactalea components, Kamon is a one of my more interesting connection abstracts.